SC'08 - Come and visit us at XtreemOS booth! The SC Conference is the premier international conference for high performance computing (HPC), networking, storage and analysis. SC'08 marks the 20th anniversary of the first SC Conference, then called Supercomputing, held in Orlando, Florida in 1988. A delegation of researchers from the consortium will showcase XtreemOS: the project and its current achievements will be presented, especially the last advancements and demos of the first system software (to be released in the coming days). Participants: Christine Morin (INRIA), Yvon Jégou (INRIA), Oscar D. Sanchez (INRIA), Sylvain Jeuland (INRIA), Pierre Riteau (INRIA), Jeff Napper (VUA). 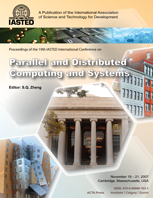 Florian Mueller (UDUS) presented the paper "Transactional Data Sharing in Grids" related to the XtreemOS Object Sharing Service (OSS), at the IASTED International Conference on Parallel and Distributed Computing and Systems in Orlando, USA. Paper abstract: "The EU-funded XtreemOS project implements a Linux-based grid operating system (OS), exploiting resources of virtual organizations through the standard POSIX interface. The Object Sharing Service (OSS) of XtreemOS addresses the challenges of transparent data sharing for distributed applications running in grids. We focus on the problem of handling consistency of replicated data in wide area networks in the presence of failures. The software architecture we propose interweaves concepts from transactional memory and peer-to-peer systems. Speculative transactions relieve programmers from complicated lock management. Super-peer-based overlay networks improve scalability and distributed hash tables speed up data search. OSS replicates objects to improve reliability and performance. In case of severe faults, the XtreemOS grid checkpointing service will support OSS. In this paper we describe the software architecture of OSS, design decisions, and evaluation results of preliminary experiments with a multi-user 3D virtual world. "